A homeless Salt Lake City couple have had a housing voucher for weeks but can’t find an apartment. They remain living on the street. 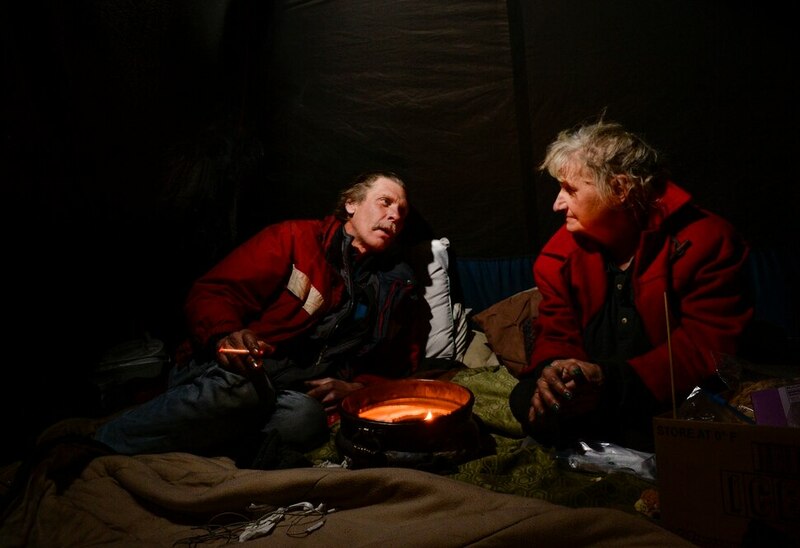 (Leah Hogsten | The Salt Lake Tribune) Ron Barrett, 55, and his wife Katherine Barrett, 54, who are homeless try to stay warm in their tent from the meager heat from a ceramic pot filled with candle wax. Their cold hands are blacken by the soot rising from the burning candle on a night that temperatures dropped to 12 degrees in Salt Lake City. It's crazy, you gotta be able to have a sense of humor, said Ron Barrett, 55, of the life circumstances that resulted in life on the streets for he and Katherine since 2017. The Barretts are trying to find housing through a Shelter Plus Care housing voucher through the Salt Lake City Housing Authority. The couple says they refuse to stay in the state's largest homeless shelter, The Road Home on Rio Grande Street, because of past threats of violence from other residents. 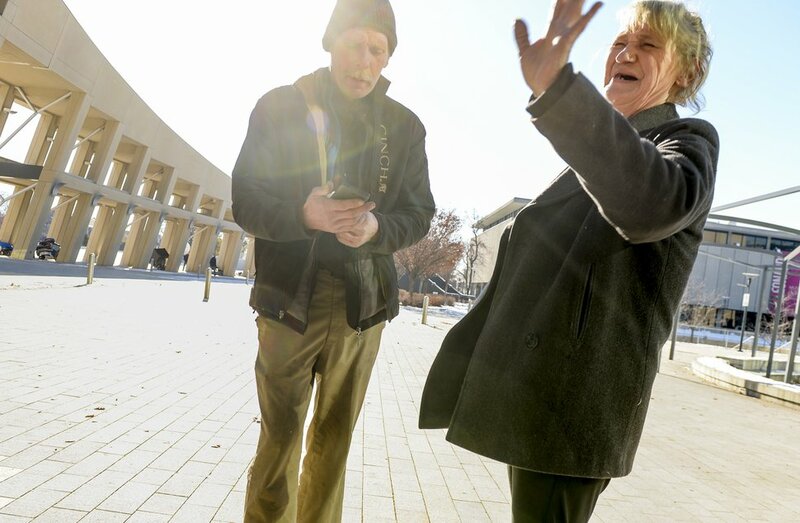 (Leah Hogsten | The Salt Lake Tribune) Katherine Barrett, 54, greets an aquaintance outside the Salt Lake Library. We're starting to have hope again, said Katherine Barrett, 54, of finding housing for her and her husband Ron Barrett, 55, center, who have been living on the streets of Salt Lake City for the past two years. The Barretts are trying to find housing through a Shelter Plus Care housing voucher through the Salt Lake City Housing Authority. The couple says they refuse to stay in the state's largest homeless shelter, The Road Home on Rio Grande Street, because of past threats of violence from other residents. 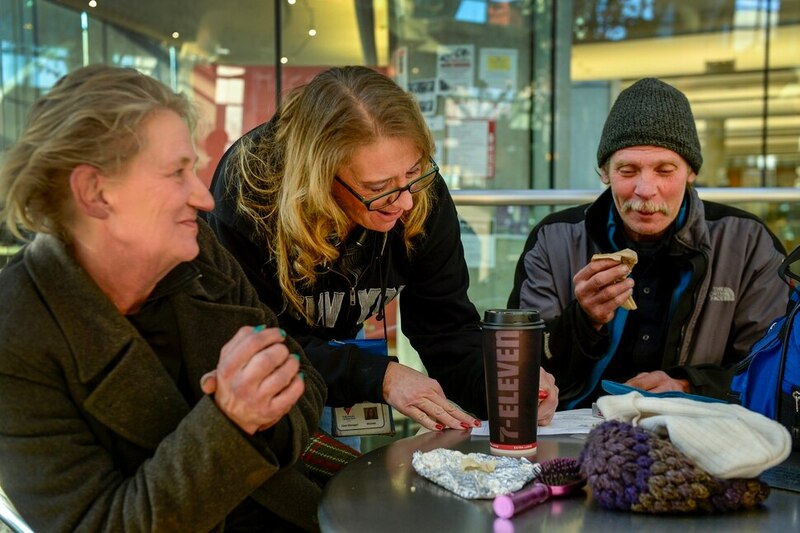 (Leah Hogsten | The Salt Lake Tribune) Katherine Barrett, 54, and her husband Ron Barrett, 55, share a laugh with Rhonda Robison, center, a homeless outreach program worker for the Volunteers of America stationed at the Salt Lake Library, as Robison writes out a clothing voucher for the two. The Barretts, who are homeless, have three months to find housing through a Shelter Plus Care housing voucher through the Salt Lake City Housing Authority. (Leah Hogsten | The Salt Lake Tribune) Ron Barrett is overwhelmed as he looks over the four shopping carts that contain his and his wife's belongings. Hours before, police officers told the homeless couple to move their tent and belongings two times during the night or risk getting another 'no camping' ticket. Ron's goal was to re-pack the tent they've been living in Salt Lake City, get organized and downsize for easier mobility, but sleep deprivation and anxiety from the night's events wore him down. They [police officers] call our tent the Hobo Palace, Barrett said. (Leah Hogsten | The Salt Lake Tribune) Ron Barrett, 55, and his wife Katherine Barrett, 54, who are homeless, try to stay warm in their tent from the meager heat from a ceramic pot filled with candle wax. Their cold hands are blacken by the soot rising from the burning candle on a night that temperatures dropped to 12 degrees in Salt Lake City. It's crazy, you gotta be able to have a sense of humor, said Ron Barrett, 55, of the life circumstances that resulted in life on the streets for he and Katherine since 2017. The Barretts are trying to find housing through a Shelter Plus Care housing voucher through the Salt Lake City Housing Authority. The couple says they refuse to stay in the state's largest homeless shelter, The Road Home on Rio Grande Street, because of past threats of violence from other residents. 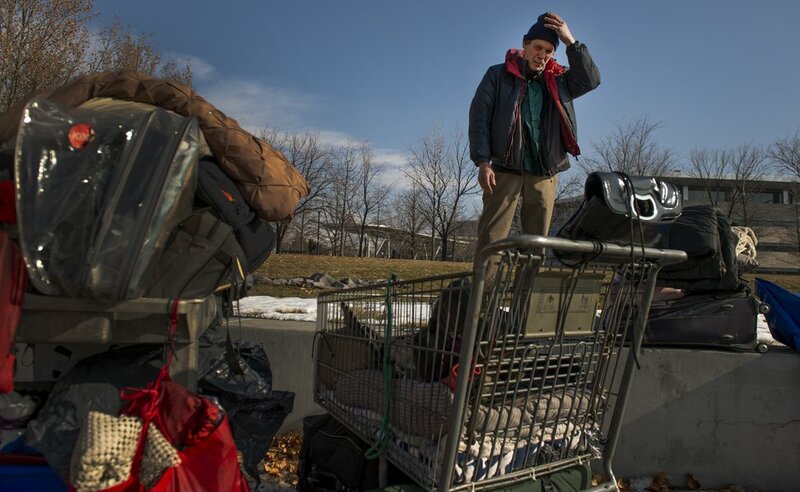 For more than two months, Ron and Katherine Barrett have spent their days searching for an apartment and their nights sleeping in the cold in a tent with a tarp over it on a patch of grass in Salt Lake City. The couple have been in and out of motels since around 2008 and on the streets since early 2017. And they’ve been searching for a place to live since Nov. 20, when they received a housing voucher that provides rental assistance to those who are chronically homeless. But it’s been difficult to find a place that meets the price and location requirements established by the federal government under the Section 8 Shelter Plus Care Housing Voucher — particularly as Utah faces what some have labeled an affordable housing crisis. In the meantime, the couple have been racking up tickets for camping on public grounds, which is prohibited under Salt Lake City code. The citations have sapped time and energy away from their apartment search. The Barretts applied for at least seven apartments so far, to no avail, and have looked at several others. They said one landlord turned them away, in likely violation of state law, because he wouldn’t accept their voucher. The Shelter Plus Care voucher is a relatively small housing program compared to others the Housing Authority of Salt Lake City offers, and it can come with more challenges, said Daniel Nackerman, the agency’s executive director. After receiving a voucher, a person has 60 days to find housing, though it’s possible to get an extension — as the Barretts did after theirs expired Jan. 20. Those are approved on a case-by-case basis and are almost always approved at the city housing authority, said Britnee Dabb, its deputy director. The vouchers also have proximity and financial requirements. The apartment must be located in Salt Lake County, and rent has to be within a certain percentage of the U.S. Department of Housing and Urban Development’s (HUD) fair market rate, which is set regionally each year. Currently, the city housing authority has capped its rent in Salt Lake County at $706 for a studio apartment and $957 for a one bedroom. Housing advocates with Salt Lake City have estimated there’s a gap of at least 7,500 apartments that are affordable to renters making $20,000 or less. Rent in the county jumped from an average of $720 a month in 2010 to $1,072 last year, according to Cushman & Wakefield’s midyear 2018 Apartment Market Report. Those challenges, paired with the voucher’s time limit and cost and location requirements, mean it has become more difficult for people seeking housing under any of the Section 8 vouchers, experts say. “The landlords can get a higher amount of rent [from others] than what a voucher that HUD will fund will pay,” said Jackie Rojas, the director of Section 8 housing with the city housing authority. But the difficulties are particularly pronounced with the Shelter Plus Care voucher like the Barretts have. Of the 117 such vouchers the county housing authority issued last year, 30.7 percent expired before the person could find housing and 44.4 percent are still open, according to Janice Kimball, the agency’s executive director. The city housing authority did not provide its numbers to The Tribune in time for publication. The Barretts, who have been married for almost 30 years and have three “beautiful children” together, hit hard times right around the time the country was tumbling into the Great Recession from 2007 to 2009. Both have health problems — Ron has been diagnosed with cancer and Katherine has multiple sclerosis — and Katherine said their medical bills began to stack up. They received housing assistance in Utah once before, in 2007, but Katherine said they were kicked out shortly after they moved in. “That really kind of pulled the rug out from me,” she said, and made her and Ron distrustful of anyone purporting to offer housing assistance. The couple applied again for housing assistance when they first started sleeping on the streets, she said, but the waitlist was too long — years rather than months. They submitted the application for their current voucher with the city’s housing authority last year, Katherine said. She wants to ensure she does everything correctly. But Katherine said she’s frustrated because she feels like she’s getting different answers from the various advocates working with her on the case — which include the Volunteers of America, the Community Connection Center, the Urban Indian Center of Salt Lake and the city housing authority. One misstep, she worries, could keep her on the streets. (Leah Hogsten | The Salt Lake Tribune) Katherine Barrett, 54, greets an aquaintance outside the Salt Lake Library. "We're starting to have hope again," said Katherine Barrett, 54, of finding housing for her and her husband Ron Barrett, 55, center, who have been living on the streets of Salt Lake City for the past two years. The Barretts are trying to find housing through a Shelter Plus Care housing voucher through the Salt Lake City Housing Authority. The couple says they refuse to stay in the state's largest homeless shelter, The Road Home on Rio Grande Street, because of past threats of violence from other residents. The Barretts have multiple evictions on their record, which, advocates say, is one of the greatest obstacles for people seeking housing with vouchers. In such a competitive market, it makes sense for landlords to give preference to people with a clean rental history, advocates acknowledge. The Barretts want nothing more than to find a place to live so they can get out of the elements, and stop being awakened multiple times each night by cops asking them to move. Getting there, though, has been anything but easy. For one thing, their voucher was approved on the cusp of the holiday season, when many advocates and landlords were out of town or off work. With at least 12 camping tickets each, which they are fighting in court, meetings with their lawyer and court dates have diverted them from their apartment hunt. (Leah Hogsten | The Salt Lake Tribune) Ron Barrett is overwhelmed as he looks over the four shopping carts that contain his and his wife's belongings. Hours before, police officers told the homeless couple to move their tent and belongings two times during the night or risk getting another 'no camping' ticket. Ron's goal was to re-pack the tent they've been living in Salt Lake City, get organized and downsize for easier mobility, but sleep deprivation and anxiety from the night's events wore him down. "They [police officers] call our tent the "Hobo Palace," Barrett said. Salt Lake City police say their first approach in dealing with campers is outreach, so they can connect them with resources and get them off the streets and into a shelter. The Barretts, for example, have had contact with the Police Department’s Community Connection Center, which is comprised of caseworkers and social workers who help people experiencing homelessness. Issuing a camping citation is a last resort, according to Josh Scharman, deputy chief of police. The Barretts refuse to stay in the state’s largest homeless shelter, The Road Home on Salt Lake City’s Rio Grande Street, because of past threats of violence from other residents. But they say they’re not service resistant. They’re just trying to stay clean, which they feel is more difficult to do at the emergency shelter. A legislative audit found last year that people are shooting up and some are overdosing inside the shelter, endangering residents and deterring at least some from seeking help there. State officials in charge of homeless programs say that conditions there have been much improved since the crackdown in the area on crime and drugs, known as Operation Rio Grande, but people like the Barretts haven’t been back to risk it. The Road Home is planned to close in mid-September, after three smaller resource centers come on line as part of a new effort to streamline and improve services for the homeless. 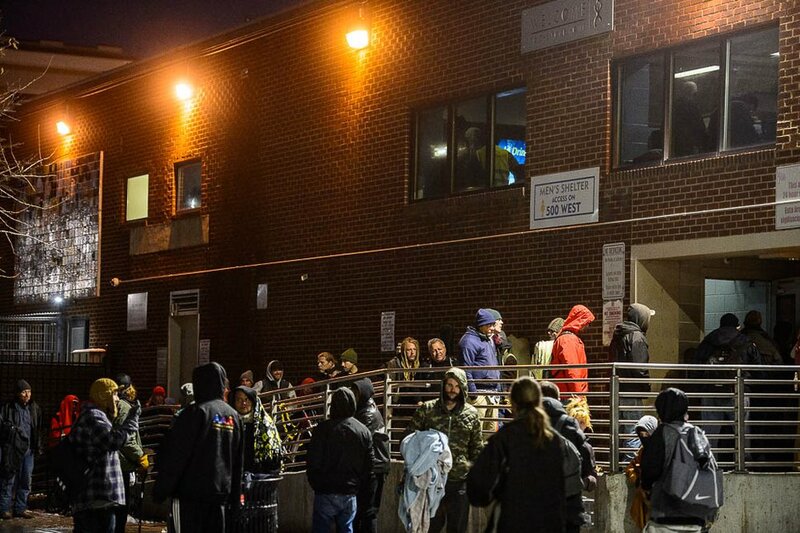 (Trent Nelson | The Salt Lake Tribune) Men line up for beds at The Road Home shelter in Salt Lake City on Wednesday Jan. 23, 2019. The Barretts are scheduled this month to appear in court, where they could receive a penalty of up to $1,000 per camping ticket — they have at least 12 each — and up to six months in jail for each class B misdemeanor. The average recommended fine for camping tickets is $680, not including surcharges, said David Ferguson, the Barretts’ lawyer, who works with the Salt Lake Legal Defender Association. The Barretts opted not to go through Salt Lake City’s homeless court — which takes into consideration the challenges people experiencing homelessness face — because they would have had to plead guilty to the charges, Ferguson said. And they believe the camping ordinance is wrong in principle. Ferguson pushed the Barretts’ original court date in December forward, in an effort to give the couple more time to search for an apartment. If they received any jail time, that would complicate things. And if they pleaded guilty, receiving another camping citation would likely be an immediate violation of probation. The couple received another camping ticket the night they were originally supposed to appear in court. Though it has become more difficult for people experiencing homelessness to find a place to live, Salt Lake City has taken steps toward increasing its stock of affordable housing. The council passed its first affordable housing plan in more than two decades last year and has added a total of 2,500 affordable housing units since 2016 — including 400 units of transitional housing to help people move out of homelessness. Ron is working construction, and Katherine hopes to find a job, too, once their lives are more stable. In the future, they hope to help other people who are experiencing homelessness. But, first, they need to get off the streets.